Good ideas. How do we integrate them? We know a lot about what innovation looked like in the past. What does it look like in the future? That’s the question that Arthur D. Little (ADL) researchers asked of more than 100 Chief Technical Officers and Chief Innovation Officers in a recently published white paper. (Click here). The ADL researchers identified five key trends that should drive innovation management over the next decade. Today, I’ll summarize the trends. In the future, I’ll to delve into each one in more detail. The most important trend — as rated by the CIOs and CTOs –is customer-based innovation — “finding new and more profound ways to engage with customers and develop deeper relationships with them.” B2B companies have traditionally emphasized customer-based innovation. After all, B2B companies have relatively few but relatively deep customers relationships. According to ADL, however, even B2C companies are now focusing less on the product itself and more on the “ownership experience”. The second trend is proactive business process innovation. I read widely on innovation and almost everything I see has to do with product innovation. ADL says this is changing but that “there is still much to be done to develop a convincing innovation management approach that is sufficiently systematic and repeatable to generate new, innovative business models.” The first objective is to deliver “thick value” — long-term relationships with multiple touch points as opposed to “thin value” transactions. Third is frugal innovation which may be better known as reverse innovation. Rather than innovating in high-value (and high-cost) knowledge economies, frugal innovation uses low-cost emerging economies to create products with “less” rather than “more”. 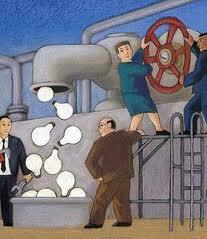 Developing a new idea in India, say, will often result in a lower cost product than developing the same idea in Europe. Frugal innovation often changes entire supply chains rather than individual products. Fourth is high speed/low risk innovation. The CIOs and CTOs say they expect even more time-to-market pressure in the next decade. Additionally, they think that product life cycles will continue to accelerate. At the same time,the customer’s ability to identify and publicize flawed products has expanded dramatically. So, even as the pressure to accelerate continues, the pressure to deliver flawless products also increases. How do you deliver high quality products in ever faster cycles? You change your business process. ADL expects to see more gradual product rollouts coupled with more pervasive and proactive post-sales service. Integrated innovation is the last major trend ADL identifies. The idea here is to take innovation processes out of the New Product Development (NPD) domain and integrate them into all business processes and strategies. Among other things, this requires collaboration across traditional functional divisions. Organizational development experts will focus on building horizontal layers to replace vertical silos. Creating an Enterprise Architecture (EA) to manage knowledge and information could drive this trend. So, five trends in innovation management – each is interesting in and of itself. Over the next few weeks, I’ll delve into each one in more detail and identify the prerequisites for success in each one. Stay tuned.